Are you stuck? Having trouble coming up with ideas for a project? I used to get so paralyzed trying to come up with new ideas for a client project or ESPECIALLY for my own projects. I've found some techniques along the way that have helped me break out of my stuck-ness and I use them with my students. I want to share them with you! As I've shared with you before, I have worked hard (and am still working) to suspend those thoughts from the Inner Critic that tell me what I "should" be creating. In the beginning of a project or idea, it's very important to give yourself room to play and explore or get into Open Mode. Further down the road in the creative process, you can invite the Inner Critic back and begin critiquing yourself. Here are a few practical techniques to help you get and stay in Open Mode and help you generate new ideas. 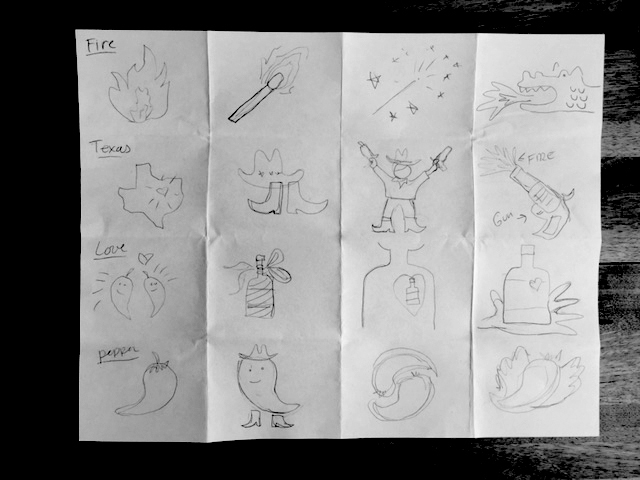 Recently, I have been teaching a design class and we are working on branding and labels for a hot sauce brand. I thought I would use this as an example since it's concrete. I also use some of these techniques in my Finding your Creative Voice Course to help students find out what they are passionate about and then express it in their art. You can use these exercises for any kind of creative expression, writing, design, art or just coming up with new ideas for any project! This is a tool that we can use to access ideas and thoughts in our subconscious or just beyond our logical, thinking mind. It frees us from the boundaries of our minds and offers us a way to access our intuition. We can use it to inform our art making process and generate ideas that might not come out when we are editing ourselves. In her book Writing Down the Bones, Natalie Goldberg talks about this kind of writing "...the aim is to burn through to the first thoughts, to the place where energy is unobstructed by social politeness or the internal censor, to the place where you are writing what your mind actually sees and feels, not what it thinks it should see or feel." Julian Cameron uses this kind of free-writing in her book the Artist's Way, she calls them "Morning pages" - "Morning Pages are three pages of longhand, stream of consciousness writing, done first thing in the morning. *There is no wrong way to do Morning Pages*– they are not high art. They are not even “writing.” They are about anything and everything that crosses your mind– and they are for your eyes only.'" 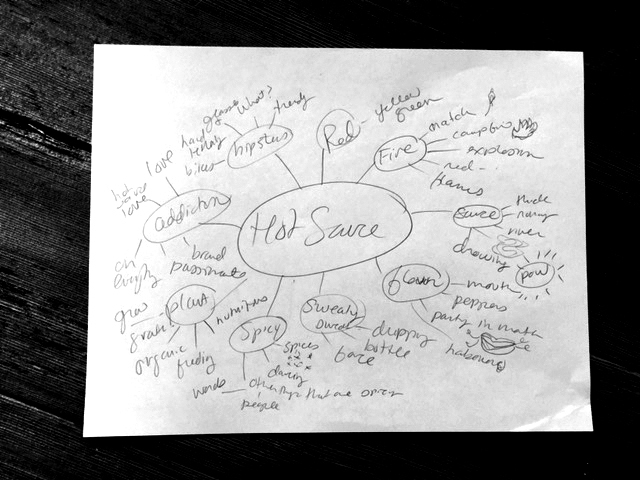 For this example, I wrote out 2 pages about everything that came to my mind when I thought about Hot Sauce - it's stream of consciousness so it doesn't need to make sense. In fact, it can be kind of humorous seeing what kind of ideas come out. I then circle some of the most important words, or the words that stand out to me. I can use these words to do even more brainstorming later. Chances are, most of you have done some kind of brainstorming before. This is another way that we can help our brain to stay in "Open Mode" where we aren't judging our thoughts, but just trying to empty our brain. The idea here is to keep free associating and write down any word that comes to mind when you think about the subject. Our brains will go on tangents and make interesting connections if we let it. Steve Jobs says "Creativity is just connecting things." This is where great ideas come from! Write down all of these connections even if they don't make sense right now. I even used some of the ideas from my free-writing to get me started and I began drawing little doodles as well. Lynda Barry has a great exercise in her book Syllabus that I've adapted and use for myself and in my classes. Take an 8.5 x 11 sheet of paper and fold it 4 times so that you have 16 squares. Then choose one word from your free writing or mind map that you think you might be able to draw. In the first square, spend 45 seconds drawing that word. Then, draw a different version of that word in the second square. Keep doing this until you've drawn something that relates to that word 4 times. Then move to the next row and do it again with a different word. This helps us to realize that there are so many different ways to visualize something. The first image in our mind is not always the most interesting. And also, they often will lead into one another. When you draw one thing, it often sparks an idea for the next image, just like in our mind map. Like the previous exercises, try not to judge yourself or hold yourself back, just doodle what first comes to mind. I've mentioned combining before, but it is one of the most effective ways to come up with a unique idea. Once you have a lot of ideas written or drawn, begin to combine them into interesting visuals or thoughts. I'm using illustrations but these could be full sketches for an art piece or they could be written words/ doodles for another type of concept. After you've created a lot of these kind of ideas, you can begin to bring your logical mind in and start refining what you want to create, putting aside ideas that aren't useful and moving forward with ideas that you like. I hope these little tricks are helpful for you. I see them work in my own life and with my students when they feel stuck. Just remember to create time and space around you at the beginning of a project and keep your eyes and mind open for interesting connections and observations that could turn into something bigger. If you are enjoying posts like these, sign up for my newsletter and get updates on my classes, fresh creative inspiration and tips to help encourage you on your creative journey. Plus, coupons for my shop and classes!